It's 2015, and it's time for every single new match-3 puzzler to come out of the woodwork, or so it seems. Chillingo's the next up with Hero Pop, yet another title that ensures you play the same game the umpteenth time in the new year as well. It's fun enough, but in the end it's same title we've seen over and over again. Is it worth your time? Only if you haven't played one of these songs in quite a while. 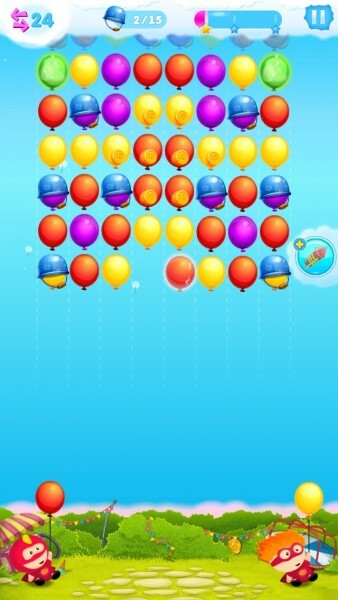 Hero Pop is easy enough to pick up and play, as you simply pop differently-colored balloons. Match the similar colors to satisfy some prerequisites in the level, as there are different objectives occasionally. Some may find you simply releasing different balloons by way of color, and others will ask you to create larger balloons by gathering five of the same color. Of course, you may still need to clear out the board as you progress, so this is important to keep in mind. This does mean that you have to plan for some sort of strategy being implemented rather than mindlessly making matches of three. That's putting it ahead of some of the other titles, as it at least gives the illusion that there's something different going on here. This is, for all intents and purposes, the very same match-3 game you've played since the advent of the titles on the App Store. The only difference this time around is that you're working with balloons and a limited number of lives. This is an extremely derivative title that, while fun and entertaining for bite-sized bits of time, while eventually begin to wear on the nerves, like a really fantastic song you've heard over and over again. The notes are all there, but it begins wearing on your nerves until you just can't take it anymore.